We played a tournament in Modesto this weekend and DD had a batting average of .500 for the weekend with 13 plate appearances, 1 walk, 5 singles and a triple with NO strikeouts. She carries a .390 average for the season (94 at bats). She is 13 playing first year 14U. That is a nice looking swing. Are you looking for suggestions for improvement or just sharing? In this AB it looks like she dropped her back shoulder and that contributed to the popup. Look at how far the shoulder drops from the start of the swing to where she slots her back elbow. She looks strong enough that she may have still gotten a hit from it, but with better hand path and bat angle it may have left the park. Also she looks to be squishing the bug a little with the back foot. This is stopping her from completely rotating and is leaving a lot of power out of her swing. Check out Albert's back foot below. No dead bugs in this swing, just a souvenir for a fan. CnD, there was a hitting clinic held by Crystl Bustos and Howard Carrier in Modesto recently, were you able to go to that? Dropping the back shoulder is a new thing that she just started doing and her hitting coach is working with her on it. By "squishing the bug", does that mean she has a little bit too much weight on her back leg? I have heard many coaches tell kids to squish the bug, including her current hitting coach who also is working on getting her to rotate more from the hips down. We're not from Modesto, we're from way north of Sacramento. Last year we went to a Jenny Finch clinic where Crystl was and the girls spent about 40 or so minutes with her. Yeah, the shoulder dropping is low hanging fruit. Should be easier to correct than the other issue. Squishing the bug is a bad cue for kids. The intent of the cue is, as you noted, to get the batter to rotate more; however when you spin around on the ball of your foot you're leaving weight on it. This means that part of the energy you are trying to transfer into the bat is being transferred to the ground! As Mark H suggested, look at the siggy site. 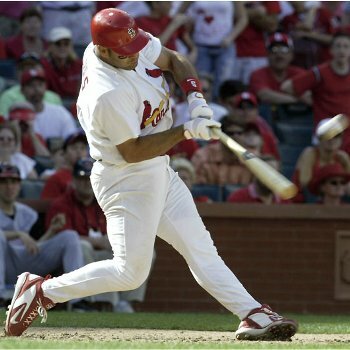 Look at fastpitch and baseball hitting examples. I don't think you'll find too many high level swings where they habitually leave weight on the backside. OK, after looking at a lot of the videos mentioned here I see what you mean about her weight being left on the back foot. Some of the elite hitters leave a little bit of weight back but very few. We will work on these 2 issues and post a video later in the season. maybe when she finally gets one out of the park! She has hit the fence a couple of times but never went over. I imagine that if there was less emphasis on squishing the bug, the rear shoulder dropping may improve as well.